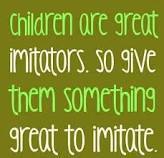 You must be credible – Show your Grand babies by example how to be kind, how to be strong, how to be loving, smart Anything just show them and they will imitate.And in fact they most likely will be more loving, smarter, kinder then we could ever imagine for ourselves. You must smile every day. Show your grandchild joy and they will naturally gravitate to joy .